Well, here we are, together again, trying to do some good, with a bit of new technology in the mix. That sounds like Johnson Controls, doesn’t it? WSJSociety.com is a start-up venture. 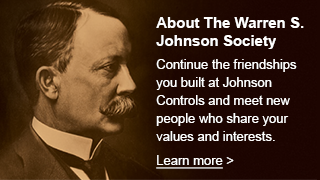 Initiated to provide the members of the Warren S. Johnson Society with a means to stay connected and engaged. When this group is connected and engaged, good things happen. Look at the company you all helped build! Thanks to Steve Roell and Alex Molinaroli who initiated the work, Kim Metcalf-Kupres who took the lead, Karen Sommer our project manager, and McDill Design who created the site, I think that we have that and a lot more! I’m Jude Anders. It’s my privilege to be the first Editor of WSJSociety.com. All of us on the leadership team of the WSJ Society are really looking forward to creating this community with you. WSJSociety.com is a tool. The community it supports will be formed by you, the users. We have shared experiences, careers at Johnson Controls. The values of the company: Integrity, Customer Satisfaction, Employee Engagement, Innovation, and Sustainability can continue to be our guide in this new venture. Some re-framing may be required for application to our membership and situation. We can do that along the way. The vision is to create a community that helps one another, enjoys shared interests, promotes continued learning and engagement, and seeks to contribute to others where it can. That’s where we’re starting. Please let us know what you think. Our first job is to help you get connected. Whenever you click on the ‘Help’ or ‘Suggestion Box’ links we get an email. Please use them. Please give us time to respond. We will, and we will work through the issue. We will be learning together. Remember those new product start ups? Well, I’m sure we will have a few bumps also. But, with a little patience, we will be doing some fantastic things before long. Please note that content will be added and new members will be joining at a good clip as we start this venture. Come back often to check it out. If you are not an active member of the WSJ Society you will need to register. Please click on the Register link at the top right of the Home page and follow the directions to register and receive instructions for payment of dues. This process will perform a verification of your information with our list of eligible candidates. If the information you provided matches the record, you will be given access to the site. Then, your subsequent logins will be as an active member. Continued access is however subject to receipt of your dues within a reasonable time period. If you are an active member of the WSJ Society, please click on the MEMBER LOGIN link at the top right of the Home page. This will take you to the Login page. There are two options on this page. One for your first time login and one for all subsequent logins. For the first time login, click on the Existing Member Login link at the right center of the page. Members who were active as of August 14, 2013 have had their information pre-populated in the system. They also received a temporary password by letter sent on August 14th. The password is shown on the last line of the letter. This page will allow you to login with your first and last name and the temporary password. It will then take you through a process to change your password on to the site. Please note that for subsequent logins, your username is required. Your username is located in your profile under your name following the ‘@’ symbol. For all subsequent logins, use the login at the left center of the page. This requires the use of your username and the password you set up on your first visit. Please don’t hesitate to use the Help link if you have a problem. The issue may be with the record. We have found some incorrect spellings, outdated emails, and name variations that cause a failure. Please be patient, we are all learning the system and changes are being made to improve. We are on our way. In the first 9 days, 17% of the membership has logged in. Did you know that the Rochester Branch had a picnic with current members and alums? Ken Reasoner passed that along as he signed in.